“Transplants” is the final show in Pioneer Winter’s four-piece installation dance site-series "Grass Stains" for its 2016 inaugural year. The performance will be held on Saturday, Dec. 17, 2016 at the Kampong, which celebrates its centennial. Nestled in Coconut Grove with a luxurious tropical landscape, the gorgeous nine-acre waterfront home turned botanical garden is a gateway into worlds outside its vicinity. There is a lily pond and antique Asian statues in the gardens and a path leading up to the home. The estate’s architecture is a combination of Spanish and Southeast Asian influences. In the fourth installation of the project conceived by Ana Mendez, nine dancers (Amanda Fisher, Jenna Balfe, Jennifer Martin Bermudez) Marcela Loayza, Monica Lopez De Victoria, Monica Uszerowicz, Rachel Carroll, Richard Vergez, and Rick Diaz will explore the subliminal storylines found in David and Marian Fairchild’s old estate. 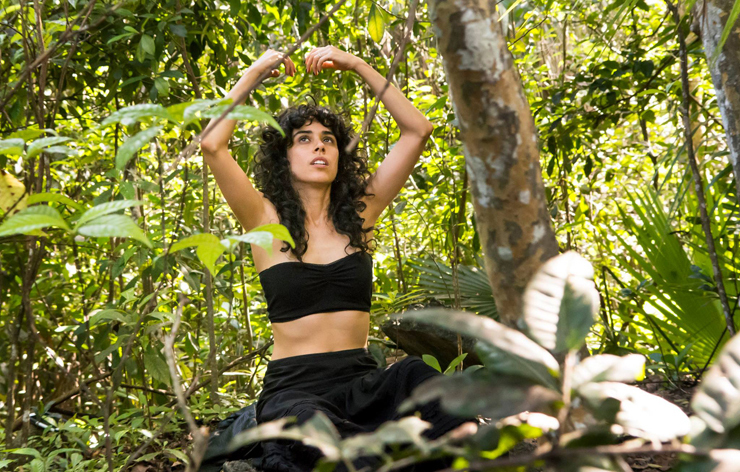 Choreographer Ana Mendez said: “I hope the performance transplants audiences.” Inspired by the voyage of all the plants that were brought to Miami by conservationist David Fairchild, the dancer thought it would be interesting to focus “on the Florida landscape and what we think it is, because most of the plants that you see around Miami are not actually native species.” Mendez continues, “It’s interesting because at the time, it would’ve been such a great adventure.” Each of these seedlings has a story of transplantation and blooming. One can imagine what it must have taken to get a plant brought to the States in those times because of the limited methods of transportation by today’s standards. Those are the pioneers of Miami, the Fairchilds the Deerings, they really made it what it is in terms of its natural beauty. These are the pioneers who built some of the most beautiful locations in the city: Vizcaya, The Deering Estate, Fairchild Botanical Gardens, and The Kampong. The latter spot is actually the location of Mendez’ performances of the production: “Transplants.” The Kampong is the former estate of one of the Fairchild family. It is a testament to their conservationism. There are many beautiful transplants on the many acres of land, which oversee a vast expanse of water. There are even some docks at the end of the acres of a hilly backyard that slant downward towards the bay lined with mangroves. 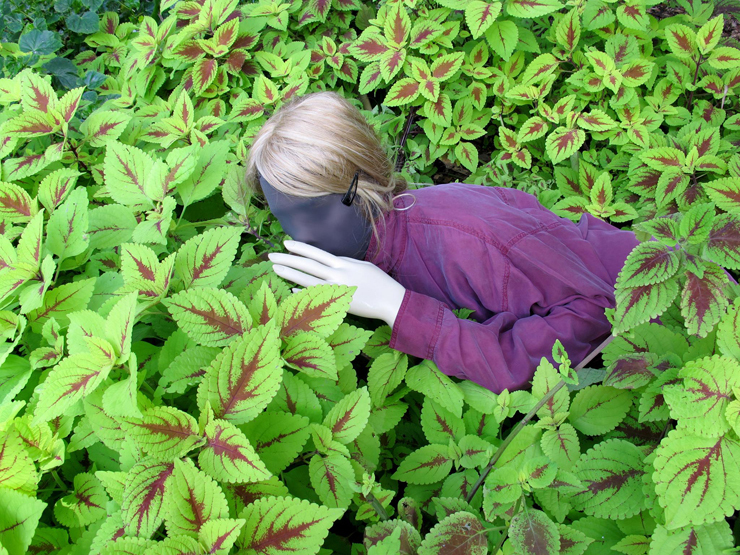 Grass Stains is a site-specific initiative created by Pioneer Winter Collective and funded by the John and James L. Knight Foundation and the State of Floria Division of Cultural Affairs that focuses on the mentoring and commissioning of six original premieres by South Florida-based performance artists. 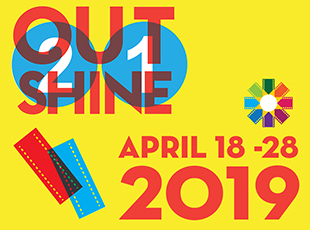 This inaugural year features the work of five women artists: Agustina Woodgate, Niurca Marquez, Marissa Nick, Ana Mendez, and Jenny Larsson, with mentoring by renowned LA-based site choreographer Stephan Koplowitz. Performances are 11 a.m., 1 p.m, and 3 p.m, Saturday, Dec. 17. at The Kampong, 4013 Douglas Road, Miami, FL 33133 For tickets, www.transplants.eventbrite.com. The ongoing art project began with “Mira El Mar” (“Look at the Sea”) at Surfside Beach. Collaborating with visual artist and costume designer Sebastian Ruiz, Marissa Alma Nick choreographed and directed the seaside performance. Along with three other dancers, Camille Arroyo, Sasha Caicedo, and Juliana Triviño, she transported viewers into Miami’s future, 75 years from now, a time when rising sea level due to climate change has transformed the landscape. 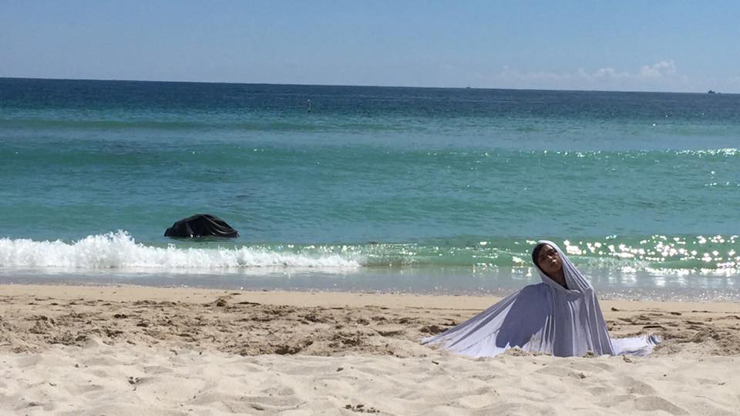 She juxtaposed white blanket-like costumes with the beach to create a metaphor for people’s illusion of safety and the city’s impending submersion. The second performance dance piece, “LAND,” was choreographed and directed by Jenny Larsson. 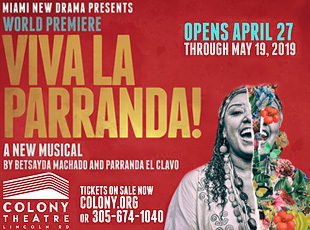 She included ten other dancers Roxana Barba, Jenna Balfe, Rachel Carrol, Jennifer Martin, Ana Mendez, Sergio Mora, Tal Shibi, Merzili Villanueva, Marie Whitman, Nikki Rollason and four musicians Maria Theresa Barbist, Charlie Zuckerman, Ivan Malespin, Ali Darvish in her ensemble cast for the performances at Florida International University’s Nature Preserve. She also collaborated with naturalists Ingrid Moncada and Megan Tait from FIU’s Office of University Sustainability. Recently, the 11-acre natural habitat, originally an environmental education project, was the subject of news because FIU plans to plow over the preserve to build new football fields, and many people oppose the institution’s plan. In fact, students, faculty and friends of the preserve circulated a petition that received more than 7,000 signatures in five days. “LAND” brought awareness to the issue of how development for commercial gain often destroys nature, relinquishing our deep connection to Mother Nature, and prohibiting us from enjoying her organic source of knowledge and relaxation. The performers held tightly to the earth as if in protest, embracing the plants, trees and soil as they would lost loved ones. They expressed grief for the beauty and tranquility of nature, which the greed of some humans threatens. 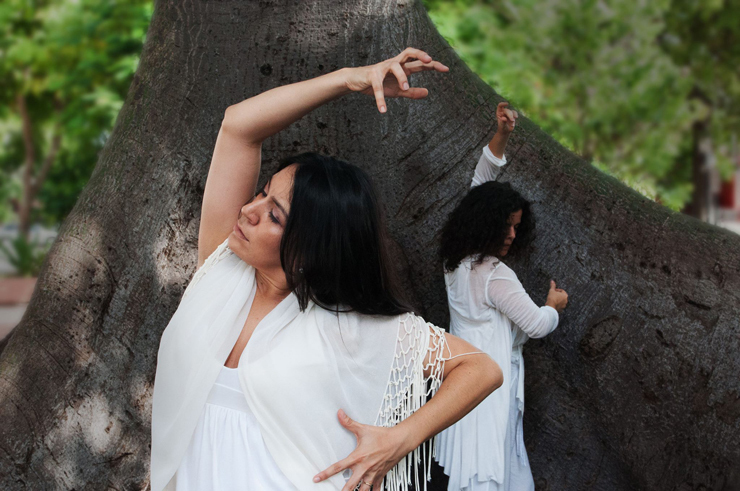 “OFRENDA,” the third event in the series, was choreographed and directed by Niurca Marquez and performed at The Ceiba Tree on Cuban Memorial Boulevard. Niurca’s ensemble consisted of performers Damaris Ferrer, Natalia Novela, and Derly Ramirez; Yoleise Salomon served as a cultural advisor, and Jose Luis De La Paz created the sound score. The Ceiba Tree is venerated throughout the Caribbean, Central and South America, and Africa. Many people believe the sacred tree connects the underworld, the terrestrial realm, and the skies. In “OFRENDA,” Marquez and her cast explored the idea of memories living within a landscape. The collage of ritual, sound and movement expressed how geography affects inhabitants, often dialoging various traditions left behind. Dressed in all white, the performers conjured the ladies in white, a protest movement enacted by wives and female relatives of jailed dissidents of the Cuban government.